Repeats of the much-loved hit US comedy Friends will no longer be shown on Channel 4 and sister station E4 from next autumn. The BBC gloats with a picture of the cast captioned "They won't be there for you any more", while Channel 4's Gill Hay says: "After 15 years, 10 hit series and 236 terrific episodes, it's time to say goodbye to old Friends and welcome new ones. We are incredibly proud to have been the home of Friends for so long, but at a point when the channel is undergoing a period of creative renewal it felt like the right time to part company." WRONG, GILL HAY. Granted, it was rare that I deliberately tuned in to an episode, but it was comforting to know that it was always there, swilling around our schedules with an average audience of 400,000, which I can't believe is THAT bad… And you even give it its own little minisite, Gill, so I don't think IT IS TIME TO SAY GOODBYE GILL YOU OBVIOUSLY LIKE IT TOO FOR GOD'S SAKE GILL JUST GIVE IT MORE TIME. 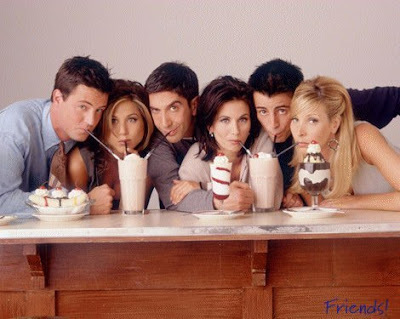 Did you see the Daily Mash article about it not mattering because the nation is able to watch Friends in their head? Pretty much true. Lady Gaga takes the biscuit!